I have used the Dvorak keyboard layout for close to 30 years. I also use Microsoft Word 2011. My problems started with the most recent update, 14.4.3. 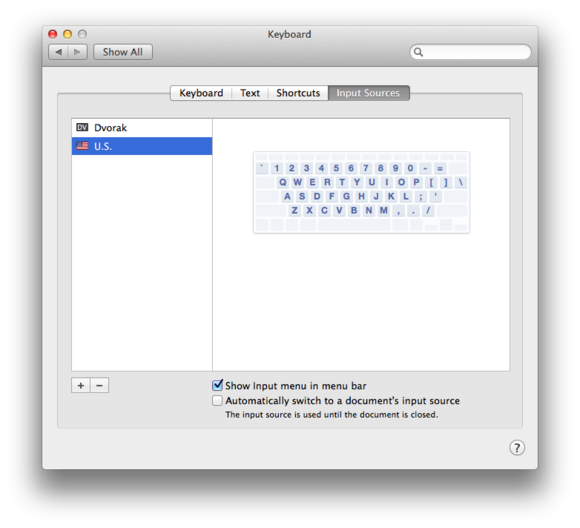 Now when I open Word and/or when I open a Word document, the keyboard layout changes to QWERTY. I talked to Microsoft support to get a workaround, but they say it is a Mac problem, not a Microsoft problem. What’s the real story and is there a workaround? I can’t swear that the Microsoft representative you spoke with normally wears a hat, but if so, they were talking through it. Given that the Dvorak keyboard setting sticks when using Word 14.4.2 but not with the latest update, of course it’s Microsoft’s problem. That problem, in detail, goes like this: As you say, when you launch Word or create a new Word document, your keyboard layout will switch away from Dvorak to the “normal” QWERTY layout. In order to use the Dvorak layout you must choose it from the keyboard input menu. As long as that document is open, you can continue to use Dvorak. However, if you close it and then open it at a later time, you’re back to QWERTY. And even if you’ve switched to Dvorak in one document, the second you open another, the switch to QWERTY occurs. So yes, it’s a bug, and one that Microsoft is solely responsible for. There is a workaround but one you may not be happy with. You can launch System Preferences, select Keyboard, choose the Input Sources tab, select every layout that isn’t Dvorak, and click the minus ( – ) button to delete them, leaving just the Dvorak layout. Do this and Word won’t have another layout to switch to and therefore will be forced to use Dvorak. Delete any keyboard layouts other than Dvorak to continue to use it in Word 14.4.3. As a Dvorak devotee this may be perfectly acceptable to you. However, if someone else sits down at your Mac and attempts to enter text, they will be completely baffled by the results. Rather than call Microsoft again and wave my answer at the person on the other end of the line while taunting “Nuh uh! Nuh uh!” you may wish to provide them with feedback (and sure, include a link to this article). You can do so by visiting the Office:Mac Contact Us page, clicking on the Product Feedback tab, and politely suggesting that the next Office update address this issue.